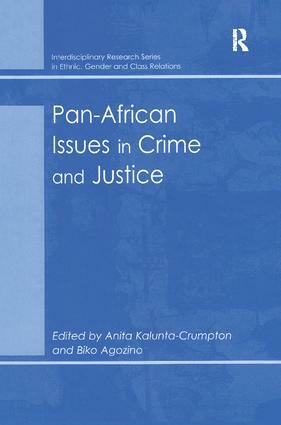 Contents: Introduction, Anita Kalunta-Crumpton and Biko Agozino; Criminology and orientalism, Anita Kalunta-Crumpton; Human rights, gender and traditional practices: the Trokosi system in West Africa, Robert Kwame Ameh; Crime, justice and social control in Egypt, Jon Alexander and Camy Pector; Crime, social change and social control in Namibia: an exploratory study of Namibian prisons, Annelie Odendaal; Criminal fraud and developing countries, Udo C. Osisiogu; Transnational crimes: the case of advanced fee fraud in Nigeria, Ihekwoaba D. Onwudiwe; Women faced with violence: a view on skin colour in Brazil, Alice Itani and Wagner Volpe; Working from the inside/out: drama as activism in Westville female prison, Miranda Young-Jahangeer; Women and (African) indigenous justice systems, Ogbonnaya Oko Elechi; Crossing the wrong boundaries: the dilemma of women's drug trade participation in Jamaica, Marlyn J. Jones; Gunboat criminology and the colonization of Africa, Emmanuel C. Onyeozili; Reparative justice: a Pan-African criminology primer, Biko Agozino; Index. Dr Anita Kalunta-Crumpton works at the School of Business and Social Sciences, University of Surrey, Roehampton, UK and Dr Biko Agozino works at the Graduate School in Humanities, University of Cape Town, South Africa. This series brings together research from a range of disciplines including criminology, cultural studies and applied social studies, focusing on experiences of ethnic, gender and class relations. In particular, the series examines the treatment of marginalized groups within the social systems for criminal justice, education, health, employment and welfare.